A high Victorian representation of Cromwell refusing the English crown, eschewing personal glory. Speech by Cromwell to the First Parliament of the Protectorate, Sept. 1654. (Antonia Fraser: “Cromwell, Our Chief of Men). Cromwell’s military standing gave him enhanced political power, just as his military victories gave him the confidence and motivation to intervene in and to shape political events. An obscure and inexperienced MP for Cambridge in 1640, by the late 1640s he was one of the power-brokers in parliament and he played a decisive role in the ‘revolution’ of winter 1648-9 which saw the trial and execution of the King and the abolition of monarchy and the House of Lords. As head of the army, he intervened several times to support or remove the republican regimes of the early 1650s. Eventually, in December 1653, he became head of state as Lord Protector, though he held that office under a written constitution which ensured that he would share political power with parliaments and a council. 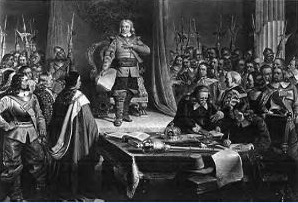 As Lord Protector for almost five years, until his death on 3 September 1658, Cromwell was able to mould policies and to fulfill some of his goals. He headed a tolerant, inclusive and largely civilian regime, which sought to restore order and stability at home and thus to win over much of the traditional political and social elite. Abroad, the army and navy were employed to promote England’s interests in an expansive and largely successful foreign policy.